A heat pump is a device that transfers heat energy from a source of heat to what is called a heat sink. Heat pumps move thermal energy in the opposite direction of spontaneous heat transfer, by absorbing heat from a cold space and releasing it to a warmer one. A heat pump uses a small amount of external power to accomplish the work of transferring energy from the heat source to the heat sink. The most common design of a heat pump involves four main components – a condenser, an expansion valve, an evaporator and a compressor. The heat transfer medium circulated through these components is called refrigerant. While air conditioners and freezers are familiar examples of heat pumps, the term "heat pump" is more general and applies to many heating, ventilating, and air conditioning (HVAC) devices used for space heating or space cooling. When a heat pump is used for heating, it employs the same basic refrigeration-type cycle used by an air conditioner or a refrigerator, but in the opposite direction – releasing heat into the conditioned space rather than the surrounding environment. In this use, heat pumps generally draw heat from the cooler external air or from the ground. Heat pumps are also increasingly used to heat domestic hot water, the hot water used for kitchens, bathrooms, clothes washers, etc. In the heating mode, heat pumps are significantly more energy efficient than simple electrical resistance heaters. However, the typical cost of installing a heat pump is higher than that of a resistance heater. When discussing heat pump efficiencies, the following terms are commonly used: coefficient of performance (COP), seasonal coefficient of performance (SCOP) and seasonal performance factor (SPF). The more efficient a heat pump is the less energy it consumes, and the more cost-effective it is to operate. There are several factors that will affect the efficiency of a heat pump such as climate, temperature, auxiliary equipment, technology, size and control system. Heat pumps are more efficient than resistance heaters because less high-grade energy is required than is released as heat. Most of the energy for heating comes from the external environment, only a fraction of which comes from electricity (or some other high-grade energy source required to run a compressor). 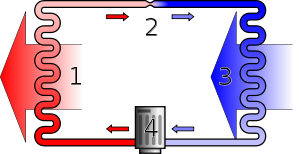 In electrically-powered heat pumps, the heat transferred can be three or four times larger than the electrical power consumed, giving the system a coefficient of performance (COP) of 3 or 4, as opposed to a COP of 1 for a conventional electrical resistance heater, in which all heat is produced from input electrical energy. 1852: Lord Kelvin describes the theory underlying heat pumps. 1855–1857: Peter von Rittinger develops and builds the first heat pump. 1928: Aurel Stodola constructs a closed loop heat pump (water source from lake Geneva) which provides heating for the Geneva city hall to this day. 1945: John Sumner, City Electrical Engineer for Norwich, installs an experimental water-source heat pump fed central heating system, using a neighbouring river to heat new Council administrative buildings. Seasonal efficiency ratio of 3.42. Average thermal delivery of 147 kW and peak output of 234 kW. 1948: Robert C. Webber is credited as developing and building the first ground heat pump. 1951: First large scale installation - The Royal Festival Hall in London is opened with a town gas-powered reversible water-source heat pump, fed by the Thames, for both winter heating and summer cooling needs. Mechanical heat pumps exploit the physical properties of a volatile evaporating and condensing fluid known as a refrigerant. The heat pump compresses the refrigerant to make it hotter on the side to be warmed, and releases the pressure at the side where heat is absorbed. The working fluid, in its gaseous state, is pressurized and circulated through the system by a compressor. On the discharge side of the compressor, the now hot and highly pressurized vapor is cooled in a heat exchanger, called a condenser, until it condenses into a high pressure, moderate temperature liquid. The condensed refrigerant then passes through a pressure-lowering device also called a metering device. This may be an expansion valve, capillary tube, or possibly a work-extracting device such as a turbine. The low-pressure liquid refrigerant then enters another heat exchanger, the evaporator, in which the fluid absorbs heat and boils. The refrigerant then returns to the compressor and the cycle is repeated. It is essential that the refrigerant reaches a sufficiently high temperature, when compressed, to release heat through the "hot" heat exchanger (the condenser). Similarly, the fluid must reach a sufficiently low temperature when allowed to expand, or else heat cannot flow from the ambient cold region into the fluid in the cold heat exchanger (the evaporator). In particular, the pressure difference must be great enough for the fluid to condense at the hot side and still evaporate in the lower pressure region at the cold side. The greater the temperature difference, the greater the required pressure difference, and consequently the more energy needed to compress the fluid. Thus, as with all heat pumps, the coefficient of performance (amount of thermal energy moved per unit of input work required) decreases with increasing temperature difference. Insulation is used to reduce the work and energy required to achieve a low enough temperature in the space to be cooled. Heat is typically transferred through engineered heating or cooling systems by using a flowing gas or liquid. Air is sometimes used, but quickly becomes impractical under many circumstances because it requires large ducts to transfer relatively small amounts of heat. In systems using refrigerant, this working fluid can also be used to transfer heat a considerable distance, though this can become impractical because of increased risk of expensive refrigerant leakage. When large amounts of heat are to be transferred, water is typically used, often supplemented with antifreeze, corrosion inhibitors, and other additives. A common source or sink for heat in smaller installations is the outside air, as used by an air-source heat pump. A fan is needed to improve heat exchange efficiency. Larger installations handling more heat, or in tight physical spaces, often use water-source heat pumps. The heat is sourced or rejected in water flow, which can carry much larger amounts of heat through a given pipe or duct cross-section than air flow can carry. The water may be heated at a remote location by boilers, solar energy, or other means. Alternatively when needed, the water may be cooled by using a cooling tower, or discharged into a large body of water, such as a lake, stream or an ocean. Geothermal heat pumps or ground-source heat pumps use shallow underground heat exchangers as a heat source or sink, and water as the heat transfer medium. This is possible because below ground level, the temperature is relatively constant across the seasons, and the earth can provide or absorb a large amount of heat. Ground source heat pumps work in the same way as air-source heat pumps, but exchange heat with the ground via water pumped through pipes in the ground. Ground source heat pumps are more simple and therefore more reliable than air source heat pumps (ASHP) as they do not need fan or defrosting systems and can be housed inside. Although a ground heat exchanger requires a higher initial capital cost, the annual running costs are lower, because well-designed ground source heat pump systems operate more efficiently because they start with a warmer source temperature than the air in winter. Heat pump installations may be installed alongside an auxiliary conventional heat source such as electrical resistance heaters, or oil or gas combustion. The auxiliary source is installed to meet peak heating loads, or to provide a back-up system. There are millions of domestic installations using air source heat pumps. They are used in climates with moderate space heating and cooling needs (HVAC) and may also provide domestic hot water. The purchase costs are supported in various countries by consumer rebates. In heating, ventilation, and air conditioning (HVAC) applications, a heat pump is typically a vapor-compression refrigeration device that includes a reversing valve and optimized heat exchangers so that the direction of heat flow (thermal energy movement) may be reversed. The reversing valve switches the direction of refrigerant through the cycle and therefore the heat pump may deliver either heating or cooling to a building. In cooler climates, the default setting of the reversing valve is heating. The default setting in warmer climates is cooling. Because the two heat exchangers, the condenser and evaporator, must swap functions, they are optimized to perform adequately in both modes. Therefore, the SEER rating, which is the Seasonal Energy Efficiency Rating, of a reversible heat pump is typically slightly less than two separately optimized machines. For equipment to receive the Energy Star Rating, it must have a rating of at least 14.5 SEER. In water heating applications, a heat pump may be used to heat or preheat water for swimming pools or heating potable water for use by homes and industry. Usually heat is extracted from outdoor air and transferred to an indoor water tank, another variety extracts heat from indoor air to assist in cooling the space. Heat pumps can be integrated in district heating systems, especially if these are operated with low temperatures. Heat pumps can also be used as heat supplier for district heating. Possible heat sources for such applications are sewage water, ambient water (like sea, lake and river water), industrial waste heat, geothermal energy, flue gas, waste heat from district cooling and heat from solar heat storage. In Europe, more than 1500 MW were installed since the 1980s, of which about 1000 MW were in use in Sweden in 2017. Large scale heat pumps for district heating combined with thermal energy storage offer high flexibility for the integration of variable renewable energy. Therefore they are regarded as a key technology for smart energy systems with high shares of renewable energy up to 100% and advanced 4th generation district heating systems. One example for such an usage is the Drammen Heat Pump commissioned in 2011. This heat pump uses heat from a fjord whose temperature is around 8 °C using 3 systems giving a combined capacity of 14 megawatts to town center residences and businesses. A city ordinance mandates this heating system for many new buildings. There is a great potential to reduce the energy consumption and related greenhouse gas emissions in the industry by application of industrial heat pumps. An international collaboration project completed in 2015 collected totally 39 examples of R&D-projects and 115 case studies worldwide. The study shows that short payback periods are possible (less than 2 years), high reduction of CO2 emissions can be achieved (in some cases more than 50%). Until the 1990s, the refrigerants were often chlorofluorocarbons (CFCs) such as R-12 (dichlorodifluoromethane), one in a class of several refrigerants using the brand name Freon, a trademark of DuPont. Its manufacture is now banned or severely restricted by the Montreal Protocol of August 1987 because of the damage that chlorofluorocarbons cause to the ozone layer if released into the atmosphere. One widely adopted replacement refrigerant is the hydrofluorocarbon (HFC) known as R-134a (1,1,1,2-tetrafluoroethane). Heat pumps using R-134a replaced R-12 (dichlorodifluoromethane) and have similar thermodynamic properties but with insignificant ozone depletion potential and a somewhat lower global warming potential. Other substances such as liquid R-717 ammonia are widely used in large-scale systems, or occasionally the less corrosive but more flammable propane or butane, can also be used. Since 2001, carbon dioxide, R-744, has increasingly been used, utilizing the transcritical cycle, although it requires much higher working pressures. In residential and commercial applications, the hydrochlorofluorocarbon (HCFC) R-22 is still widely used, however, HFC R-410A does not deplete the ozone layer and is being used more frequently; however, it is a powerful greenhouse gas which contributes to climate change. Hydrogen, helium, nitrogen, or plain air is used in the Stirling cycle, providing the maximum number of options in environmentally friendly gases. More recent refrigerators use R600A which is isobutane, and does not deplete the ozone and is less harmful to the environment. Dimethyl ether (DME) has also gained in popularity as a refrigerant. As quite similar criteria shall be fulfilled by working fluids applied to heat pumps, refrigeration and ORC cycles, several working fluids are applied by all these technologies and can be sorted into the same thermodynamic classification category based on the shape of their saturation curve. A ground source heat pump has no need for an outdoor unit with moving mechanical components: no external noise is produced. An air source heat pump requires an outdoor unit containing moving mechanical components including fans which produce noise. In 2013, the European Committee for Standardization (CEN) started work on standards for protection from noise pollution caused by heat pump outdoor units. Although the CEN/TC 113 Business Plan outset was that "consumers increasingly require a low acoustic power of these units as the users and their neighbours now reject noisy installations", no standards for noise barriers or other means of noise protection had been developed by January 2016. In the United States, the allowed nighttime noise level was defined in 1974 as "an average 24-hr exposure limit of 55 A-weighted decibels (dBA) to protect the public from all adverse effects on health and welfare in residential areas (U.S. EPA 1974). This limit is a day–night 24-hr average noise level (LDN), with a 10-dBA penalty applied to nighttime levels between 2200 and 0700 hours to account for sleep disruption and no penalty applied to daytime levels. The 10-dB(A) penalty makes the permitted U.S. nighttime noise level equal to 45 dB(A), which is more than is accepted in some European countries but less than the noise produced by some heat pumps. Another feature of air source heat pumps (ASHPs) external heat exchangers is their need to stop the fan from time to time for a period of several minutes in order to get rid of frost that accumulates in the outdoor unit in the heating mode. After that, the heat pump starts to work again. This part of the work cycle results in two sudden changes of the noise made by the fan. The acoustic effect of such disruption on neighbors is especially powerful in quiet environments where background nighttime noise may be as low as 0 to 10dBA. This is included in legislation in France. According to the French concept of noise nuisance, "noise emergence" is the difference between ambient noise including the disturbing noise, and ambient noise without the disturbing noise. When comparing the performance of heat pumps, it is best to avoid the word "efficiency", which has a very specific thermodynamic definition. The term coefficient of performance (COP) is used to describe the ratio of useful heat movement per work input. Most vapor-compression heat pumps use electrically powered motors for their work input. According to the US United States Environmental Protection Agency (EPA), geothermal heat pumps can reduce energy consumption up to 44% compared with air-source heat pumps and up to 72% compared with electric resistance heating. The COP for heat pumps range from 3.2 to 4.5 for air source heat pumps to 4.2 to 5.2 for ground source heat pumps. When used for heating a building with an outside temperature of, for example, 10 °C, a typical air-source heat pump (ASHP) has a COP of 3 to 4, whereas an electrical resistance heater has a COP of 1.0. That is, one joule of electrical energy will cause a resistance heater to produce only one joule of useful heat, while under ideal conditions, one joule of electrical energy can cause a heat pump to move three or four joules of heat from a cooler place to a warmer place. Note that an air source heat pump is more efficient in hotter climates than cooler ones, so when the weather is much warmer the unit will perform with a higher COP (as it has a smaller temperature gap to bridge). When there is a wide temperature differential between the hot and cold reservoirs, the COP is lower (worse). In extreme cold weather the COP will go down to 1.0. On the other hand, well designed ground-source heat pump (GSHP) systems benefit from the moderate temperature underground, as the ground acts naturally as a store of thermal energy. Their year-round COP is therefore normally in the range of 3.2 to 5.0. When there is a high temperature differential (e.g., when an air-source heat pump is used to heat a house with an outside temperature of, say, 0 °C (32 °F)), it takes more work to move the same amount of heat to indoors than on a milder day. Ultimately, due to Carnot efficiency limits, the heat pump's performance will decrease as the outdoor-to-indoor temperature difference increases (outside temperature gets colder), reaching a theoretical limit of 1.0 at −273 °C. In practice, a COP of 1.0 will typically be reached at an outdoor temperature around −18 °C (0 °F) for air source heat pumps. Also, as the heat pump takes heat out of the air, some moisture in the outdoor air may condense and possibly freeze on the outdoor heat exchanger. The system must periodically melt this ice; this defrosting translates into an additional energy (electricity) expenditure. When it is extremely cold outside, it is simpler to heat using an alternative heat source (such as an electric resistance heater, oil furnace, or gas furnace) rather than to run an air-source heat pump. Also, avoiding the use of the heat pump during extremely cold weather translates into less wear on the machine's compressor. The design of the evaporator and condenser heat exchangers is also very important to the overall efficiency of the heat pump. The heat exchange surface areas and the corresponding temperature differential (between the refrigerant and the air stream) directly affect the operating pressures and hence the work the compressor has to do in order to provide the same heating or cooling effect. Generally, the larger the heat exchanger, the lower the temperature differential and the more efficient the system becomes. Heat exchangers are expensive, requiring drilling for some heat-pump types or large spaces to be efficient, and the heat pump industry generally competes on price rather than efficiency. Heat pumps are already at a price disadvantage when it comes to initial investment (not long-term savings) compared to conventional heating solutions like boilers, so the drive towards more efficient heat pumps and air conditioners is often led by legislative measures on minimum efficiency standards. Electricity rates will also influence the attractiveness of heat pumps. In cooling mode, a heat pump's operating performance is described in the US as its energy efficiency ratio (EER) or seasonal energy efficiency ratio (SEER), and both measures have units of BTU/(h·W) (1 BTU/(h·W) = 0.293 W/W). A larger EER number indicates better performance. The manufacturer's literature should provide both a COP to describe performance in heating mode, and an EER or SEER to describe performance in cooling mode. Actual performance varies, however, and depends on many factors such as installation details, temperature differences, site elevation, and maintenance. As with any piece of equipment that depends on coils to transfer heat between air and a fluid, it is important for both the condenser and evaporator coils to be kept clean. If deposits of dust and other debris are allowed to accumulate on the coils, the efficiency of the unit (both in heating and cooling modes) will suffer. Heat pumps are more effective for heating than for cooling an interior space if the temperature differential is held equal. This is because the compressor's input energy is also converted to useful heat when in heating mode, and is discharged along with the transported heat via the condenser to the interior space. But for cooling, the condenser is normally outdoors, and the compressor's dissipated work (waste heat) must also be transported to outdoors using more input energy, rather than being put to a useful purpose. For the same reason, opening a food refrigerator or freezer has the net effect of heating up the room rather than cooling it, because its refrigeration cycle rejects heat to the indoor air. This heat includes the compressor's dissipated work as well as the heat removed from the inside of the appliance. is the compressor's dissipated work. All temperatures are absolute temperatures usually measured in kelvins or degrees Rankine. The coefficient of performance (COP) increases as the temperature difference, or "lift", decreases between heat source and destination. The COP can be maximized at design time by choosing a heating system requiring only a low final water temperature (e.g. underfloor heating), and by choosing a heat source with a high average temperature (e.g. the ground). Domestic hot water (DHW) and conventional heating radiators require high water temperatures, reducing the COP that can be attained, and affecting the choice of heat pump technology. One observation is that while current "best practice" heat pumps (ground source system, operating between 0 °C and 35 °C) have a typical COP around 4, no better than 5, the maximum achievable is 8.8 because of fundamental Carnot cycle limits. This means that in the coming decades, the energy efficiency of top-end heat pumps could roughly double. Cranking up efficiency requires the development of a better gas compressor, fitting HVAC machines with larger heat exchangers with slower gas flows, and solving internal lubrication problems resulting from slower gas flow. The two main types of heat pumps are compression and absorption. Compression heat pumps operate on mechanical energy (typically driven by electricity), while absorption heat pumps may also run on heat as an energy source (from electricity or burnable fuels). An absorption heat pump may be fueled by natural gas or LP gas, for example. While the gas utilization efficiency in such a device, which is the ratio of the energy supplied to the energy consumed, may average only 1.5, that is better than a natural gas or LP gas furnace, which can only approach 1. By definition, all heat sources for a heat pump must be colder in temperature than the space to be heated. Most commonly, heat pumps draw heat from the air (outside or inside air) or from the ground (groundwater or soil). The heat drawn from ground-sourced systems is in most cases stored solar heat, and it should not be confused with direct geothermal heating, though the latter will contribute in some small measure to all heat in the ground. True geothermal heat, when used for heating, requires a circulation pump but no heat pump, since for this technology the ground temperature is higher than that of the space that is to be heated, so the technology relies only upon simple heat convection. Other heat sources for heat pumps include water; nearby streams and other natural water bodies have been used, and sometimes domestic waste water (via drain water heat recovery) which is often warmer than cold winter ambient temperatures (though still of lower temperature than the space to be heated). Air-air heat pumps, that extract heat from outside air and transfer this heat to inside air, are the most common type of heat pumps and the cheapest. These are similar to air conditioners operating in reverse. Air-water heat pumps are otherwise similar to air-air heat pumps, but they transfer the extracted heat into a water heating circuit, floor heating being the most efficient, and they can also transfer heat into a domestic hot water tank for use in showers and hot water taps of the building. However, ground-water heat pumps are more efficient than air-water heat pumps, and therefore they are often the better choice for providing heat for the floor heating and domestic hot water systems. Air source heat pumps are relatively easy and inexpensive to install and have therefore historically been the most widely used heat pump type. However, they suffer limitations due to their use of the outside air as a heat source. The higher temperature differential during periods of extreme cold leads to declining efficiency. In mild weather, COP may be around 4.0, while at temperatures below around 0 °C (32 °F) an air-source heat pump may still achieve a COP of 2.5. The average COP over seasonal variation is typically 2.5-2.8, with exceptional models able to exceed this in mild climates. Ground-source heat pumps, also called geothermal heat pumps, typically have higher efficiencies than air-source heat pumps. This is because they draw heat from the ground or groundwater which is at a relatively constant temperature all year round below a depth of about 30 feet (9 m). This means that the temperature differential is lower, leading to higher efficiency. Well maintained ground-source heat pumps typically have COPs of 4.0 at the beginning of the heating season, with lower seasonal COPs of around 3.0 as heat is drawn from the ground. The tradeoff for this improved performance is that a ground-source heat pump is more expensive to install, due to the need for the drilling of boreholes for vertical placement of heat exchanger piping or the digging of trenches for horizontal placement of the piping that carries the heat exchange fluid (water with a little antifreeze). When compared, groundwater heat pumps are generally more efficient than heat pumps using heat from the soil. Closed loop soil or ground heat exchangers tend to accumulate cold if the ground loop is undersized. This can be a significant problem if nearby ground water is stagnant or the soil lacks thermal conductivity, and the overall system has been designed to be just big enough to handle a "typical worst case" cold spell, or is simply undersized for the load. One way to fix cold accumulation in the ground heat exchanger loop is to use ground water to cool the floors of the building on hot days, thereby transferring heat from the dwelling into the ground loop. There are several other methods for replenishing a low temperature ground loop; one way is to make large solar collectors, for instance by putting plastic pipes just under the roof, or by putting coils of black polyethylene pipes under glass on the roof, or by piping the tarmac of the parking lot. A further solution is to ensure ground collector arrays are correctly sized, by ensuring soil thermal properties and thermal conductivity are correctly measured and integrated into the design. Hybrid (or twin source) heat pumps: when outdoor air is above 4 to 8 Celsius, (40-50 Fahrenheit, depending on ground water temperature) they use air; when air is colder, they use the ground source. These twin source systems can also store summer heat, by running ground source water through the air exchanger or through the building heater-exchanger, even when the heat pump itself is not running. This has dual advantage: it functions as a low running cost for air cooling, and (if ground water is relatively stagnant) it cranks up the temperature of the ground source, which improves the energy efficiency of the heat pump system by roughly 4% for each degree in temperature rise of the ground source. The air/water-brine/water heat pump is a hybrid heat pump, developed in Rostock, Germany, that uses only renewable energy sources. Unlike other hybrid systems, which usually combine both conventional and renewable energy sources, it combines air and geothermal heat in one compact device. The air/water-brine/water heat pump has two evaporators — an outside air evaporator and a brine evaporator — both connected to the heat pump cycle. This allows use of the most economical heating source for the current external conditions (for example, air temperature). The unit automatically selects the most efficient operating mode — air or geothermal heat, or both together. The process is controlled by a control unit, which processes the large amounts of data delivered by the complex heating system. The control unit comprises two controllers, one for the air heat cycle and one for the geothermal circulation, in one device. All components communicate over a common bus to ensure they interact to enhance the efficiency of the hybrid heating system. The German Patent and Trade Mark Office in Munich granted the air/water-brine/water heat pump a patent in 2008, under the title “Heat pump and method for controlling the source inlet temperature to the heat pump”. This hybrid heat pump can be combined with a solar thermal system or with an ice-storage. It trades and is marketed under the name ThermSelect. In the United Kingdom, ThermSelect won the 2013 Commercial Heating Product of the Year award of the HVR Awards for Excellence, organised by Heating and Ventilating Review, an industry magazine. A solar-assisted heat pump is a machine that represents the integration of a heat pump and thermal solar panels in a single integrated system. Typically these two technologies are used separately (or only placing them in parallel) to produce hot water. In this system the solar thermal panel performs the function of the low temperature heat source and the heat produced is used to feed the heat pump's evaporator. The goal of this system is to get high COP and then produce energy in a more efficient and less expensive way. Solid state heat pumps using the thermoelectric effect have improved over time to the point where they are useful for certain refrigeration tasks. Thermoelectric (Peltier) heat pumps are generally only around 10-15% as efficient as the ideal refrigerator (Carnot cycle), compared with 40–60% achieved by conventional compression cycle systems (reverse Rankine systems using compression/expansion); however, this area of technology is currently the subject of active research in materials science. A reason why this is popular is because it has a "long lifetime" as there are no moving parts and it does not use potentially hazardous refrigerants. ^ Bundschuh, Jochen; Chen, Guangnan (2014-03-07). Sustainable Energy Solutions in Agriculture. CRC Press. p. 111. ISBN 9781315778716. ^ https://heatpumpingtechnologies.org/market-technology/heat-pump-work/ Article on IEA HPT TCP How does a heat pump work? ^ O'Keefe, Philip; O'Brien, Geoff; Pearsall, Nicola (2010-01-01). The Future of Energy Use. Earthscan. p. 224. ISBN 9781844075041. ^ Banks, David L. (2008-05-06). An Introduction to Thermogeology: Ground Source Heating and Cooling (PDF). Wiley-Blackwell. ISBN 978-1-4051-7061-1. ^ "What is a heat pump? History and information about heat pump technology". Finn Geotherm. Retrieved 2017-07-01. ^ Banks, David (August 2012). An Introduction to Thermogeology: Ground Source Heating and Cooling. John Wiley & Sons. p. 123. ^ "Festival Hall Heat Pump, London, UK". Flickr. Retrieved 2017-07-01. ^ Dincer, Ibrahim; Rosen, Marc A. (2007-09-18). EXERGY: Energy, Environment and Sustainable Development. Elsevier. p. 98. ISBN 9780080531359. ^ "Introduction to Heat Pumps". Automatic Heating. Retrieved 2018-11-22. ^ "Heat Pump Systems". U.S. Department of Energy. ^ "Renewable Heat Incentive – Domestic RHI – paid over 7 years". Ground Source Heat Pump Association. ^ "Heating And Cooling Mechanics and Terminology - R.F. Ohl". Retrieved 2016-09-20. ^ a b David, Andrei; et al. (2017). "Heat Roadmap Europe: Large-Scale Electric Heat Pumps in District Heating Systems". Energies. 10 (4): 578. doi:10.3390/en10040578. ^ Lund, Henrik; et al. (2014). "4th Generation District Heating (4GDH): Integrating smart thermal grids into future sustainable energy systems". Energy. 68: 1–11. doi:10.1016/j.energy.2014.02.089. ^ "Refrigerants - Environmental Properties". The Engineering ToolBox. Retrieved 2016-09-12. ^ Ecometrica.com. "Calculation of green house gas potential of R-410A". Retrieved 2015-07-13. ^ Itteilag, Richard L. (2012-08-09). Green Electricity and Global Warming. AuthorHouse. p. 77. ISBN 9781477217405. ^ "HEAT PUMPS AND AIR CONDITIONING UNITS, Social Factors, CEN/TC 113 Business Plan, p. 2" (PDF). Retrieved 23 January 2016. ^ "Monica S. Hammer, Tracy K. Swinburn, and Richard L. Neitzel "Environmental Noise Pollution in the United States: Developing an Effective Public Health Response" Environmental Health Perspectives V122,I2,2014". Retrieved 25 January 2016. ^ "Hannabery HVAC "Commonly Reported HVAC Problems: Outdoor unit makes strange or loud noises"". Retrieved 3 February 2016. ^ "Hiil innovating Justice "How to determine acceptable levels of noise nuisance (France)". Retrieved 25 January 2016. ^ "Code de la santé publique - Article R1334-33 (in French)". Retrieved 8 February 2016. ^ "Choosing and Installing Geothermal Heat Pumps". Energy.gov. Retrieved 30 September 2014. ^ Fischer, David; Madani, Hatef (2017). "On heat pumps in smart grids: A review" (PDF). Renewable and Sustainable Energy Reviews. 70 (2): 342–357. doi:10.1016/j.rser.2016.11.182. ^ BSRIA, "European energy legislation explained", www.bsria.co.uk, May 2010. ^ a b c d The Canadian Renewable Energy Network 'Commercial Earth Energy Systems', Figure 29. . Retrieved December 8, 2009. ^ Technical Institute of Physics and Chemistry, Chinese Academy of Sciences 'State of the Art of Air-source Heat Pump for Cold Region', Figure 5. . Retrieved April 19, 2008. ^ a b SINTEF Energy Research 'Integrated CO2 Heat Pump Systems for Space Heating and DHW in low-energy and passive houses', J. Steen, Table 3.1, Table 3.3 Archived 2009-03-18 at the Wayback Machine. . Retrieved April 19, 2008. ^ "Heat pumps sources including groundwater, soil, outside and inside air)" (PDF). Archived from the original (PDF) on 2009-10-07. Retrieved 2010-06-02. ^ "Homeowners using heat pump systems" (PDF). United States Department of Energy. September 1998. Archived from the original (PDF) on January 31, 2008. ^ "Pompe di calore elio-assistite" (in Italian). Retrieved 21 June 2016.